Conrad Balatoni isn’t the only Kilmarnock player who’ll be visiting his first footballing home on Saturday when Kilmarnock pitch up at Tynecastle, but he’s arguably, and somewhat surprisingly, the one who’s made the biggest impact against his former club. After three years with Partick Thistle that included a title and promotion in 2012/13, then manager Gary Locke took Balatoni to Kilmarnock on a free transfer last September, initially on a six-month deal that has since been extended until the summer 2018. Tynecastle, or more specifically Riccarton, is where it all started for the Leeds-born centre back and, having returned with two different clubs since leaving Hearts in 2012, it’s a fixture he always eagerly anticipates. Balatoni’s late equaliser at Tynecastle back in October was his first goal for his new club. It remained his only goal until Hearts travelled to Rugby Park in the New Year fixture on January 2. Once again he found the net, this time giving the hosts the lead, only for Gavin Reilly to equalise on the stroke of half-time. Further second-half strikes from Callum Paterson and Josh Magennis meant another share of the spoils. His scrambled effort in front of the travelling support prompted the old ‘cupped ear’ celebration in response to some earlier stick. “I went down injured and a few of the fans were giving me a bit of abuse, so I thought I’d just give some back!” he laughed. “I was just telling them to keep it quiet. Sometimes things like that come back and bite fans, but it was just a bit of banter. We’d had a good start to that game so it was quite nice to score in front of the away fans. “Although I never played for the first team, it’s nice to score against the club that deems you not good enough. People have their opinions but that’s football and I went away and I’ve probably become a better player because of that. There’s absolutely no hard feelings or anything with the club but I’ll be going out to do a job for Kilmarnock. Had his career not worked out the way it has, he could have easily been one of those supporters in the stand. Having moved to Scotland at a young age, Hearts were the club Balatoni supported as he grew up in Edinburgh. While he’ll always be grateful for the opportunity to begin his career at Tynecastle, the defender admitted he’s developed a more professional attitude as his career has progressed. 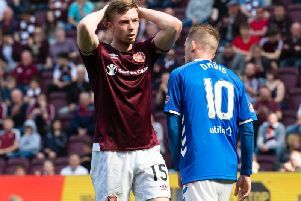 “I supported Hearts when I was younger, but as I’ve got into professional football, I’ve kind of stayed away from supporting anyone,” he explained. “I just enjoy football in general now. It’s just great to play and I don’t really support anyone. Another player who moved on from Hearts for regular football was Balatoni’s team-mate in Ayrshire, Kevin McHattie. Given current left-back Juwon Oshaniwa’s struggle for form since joining Robbie Neilson’s ranks, Balatoni sees Hearts’ loss very much as Killie’s gain. His former employers go into Saturday’s clash having endured a difficult couple of weeks. A painful Scottish Cup exit at the hands of Hibs preceded a late 2-1 reverse at basement club Dundee United last weekend, and Balatoni acknowledges that Killie need to be prepared to face a potential maroon backlash.